In Aleks Merilo’s play, The Widow of Tom’s Hill, human nature is tested in the face of a life-threatening plague. Under Rachel Black Spaulding’s direction, this play takes place in a small town off the coast of Washington in 1918, with audiences first meeting a young widow named Aideen (Lucy Lavely) struggling to provide for her young child. She must fight for survival and take caution against anyone who crosses her path. From the beginning scene, audiences can surmise the rough past she’s encountered that’s forced her to become her own soldier against the cruel, harsh outside world. One day while protecting her child, Aideen notices a presence in her surroundings and is greeted by an authoritative voice. A young sailor (Derek Grabner) is sent to warn her about the plague that has erupted in the town and the destruction it has caused. He delivers the information in tiny pieces, forcing her to question the hysteria. He advises her to stay on her side of the blockade and provides specific instructions about who may be watching. The viewer is instantly intrigued about not only the severity of the plague, but the relationship that will develop between the two as the story unfolds. Lavely and Grabner provide breathtaking portrayals of these two people who are testing each other to uncover the truth. Their dialogue and emotional tone provide clues into their pasts as well as to what they are seeking for the future. Although the chemistry between this mysterious pair is hypnotic, at times it felt as though they were talking at each other, instead of connecting more authentically. The scenic design by Miguel Urbino is representative of a naval yard, using simple props such as rope and a wood floor that makes up the dock. Audiences are on the same level as the performers and receive a special treat in this unique space, as they are inches away from the action. The basic backdrop very much provides the feel of a tiny coastal town with just enough equipment that isn’t distracting. The intimacy of the space heightens this emotional and gripping tale, as audience members can see every reaction and expression up close. The costume design by Ari Fulton also honors the time period realistically. 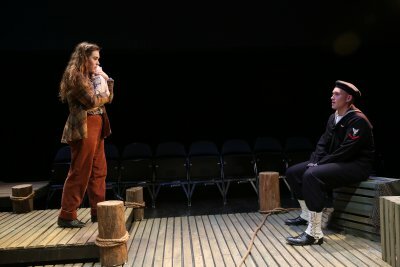 The sailor appears in a navy uniform with a traditional cap and boots, and Aideen is also dressed in a long jacket, boots and fisherman pants emphasizing the practicality of her garb. The Widow of Tom’s Hill hinges on the core of human nature when tragedy strikes and what is worth fighting for. As individuals face desperation and are forced to make difficult choices, their true colors emerge, and may cause heartbreak and pain to those who loved them the most. This play examines all of these challenges with a close lens and makes you ponder your morals and choices in the face of disaster and death. Captivating, alluring and powerful, The Widow of Tom’s Hill opens the mind and shines a light on human motives and expectations. For tickets, call Ticket Central at (212) 279-4200 or visit to http://www.59e59.org.